Hundreds of flights were canceled in Chicago Friday afternoon ahead of forecast snow and possibly freezing rain. Chicago's O'Hare International Airport reported as of 9 p.m. Friday that 382 flights had been canceled. Another 113 flights were canceled at Midway Airport. A Winter Weather Advisory took effect in the Chicago area at noon as another storm system moved in with the potential to bring several inches of snow this weekend. The National Weather Service advisory will continue until 6 a.m. Sunday, warning of snow, sleet and blowing snow at times. The bulk of the next snow system will likely arrive heading into the afternoon and evening hours, potentially impacting rush hour travel. 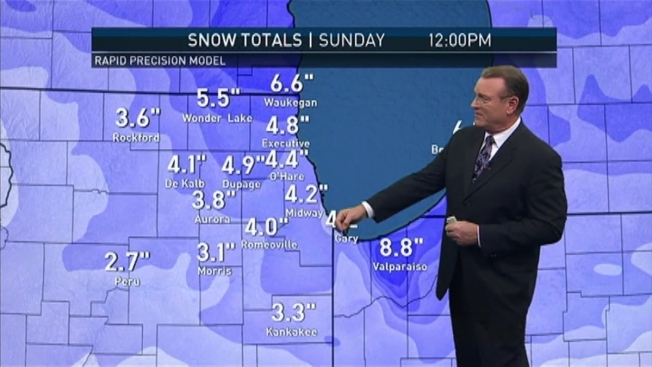 Projected snowfall totals are expected to change, but Friday models showed areas north of Chicago could see 8 to 10 inches of snow by the time the system moves out. In and around the city, totals are expected to be between 4 and 8 inches, though that number could change significantly depending on if the snow begins to mix with freezing rain or sleet. The Winter Weather Advisory anticipates between 3 and 5 inches across the area. Areas south of Interstate 80 will likely see lower accumulations, with anywhere from 2 to 4 inches of snow expected. The heaviest snow is forecast to fall late Friday and into Saturday morning. But the snow may transition to or mix with freezing rain, sleet and possibly even rain for a time which would impact storm totals dramatically before ending Saturday night or early Sunday. Any icy combination could also make travel even more dangerous. Brutally cold temperatures return Sunday with highs in the single digits once again and wind chill values as low as -15. Highs are set to gradually warm throughout next week, however.